Flaming Microwave, NOT on the agenda for today. Brought to you today By WalMart and Emerson. I recognized the beep as the microwave. But, I hadn’t used it at all today. Weird. “Beep, Beep” It kept beeping. We ran into the kitchen to find the front panel of the microwave had caught fire, along with a dish towel laying on the counter in front of it. The flames were licking at the front of the microwave.. creeping higher. My heart thumped in my chest, as I grabbed the towel to beat down the flames. What felt like forever- was only, really, a few seconds of fire fighting. But this was fire fighting in my kitchen. While the fire was doused quick enough- but the reeking smell of flaming microwave may never leave. I have no idea, what happened. No one was near it. It was not, nor had it been used. It simply started beeping and flaming. The front panel was toasted and dripped molten plastic onto my counter top. The counter top is scorched. My husband carried the microwave- still warm, but no longer smoldering, back to the WalMart store where it was purchased on November 27. The Walmart employees had limitations as to what they could do to help. My Husband was given the customer service number for Emerson. No answer. He called from the WalMart customer service area. No answer sums up the situation. Walmart had no answer and offered no solution. Emerson’s customer service only handles problems during limited hours. My house could have burned down. After much argument- Walmart eventually exchanged the flaming model for a smaller, cheaper one. Am I satisfied with this outcome? No. My kids could have been hurt, or the house could have burned to the ground. We were lucky, the house is here. No one suffered more than fumes and stress. (The youngest HATES the smell of flaming microwave, BTW.) There is a scorch on the counter top and we’re out the price difference between what we paid for, and what we now have. (A microwave that will make popcorn- but not much else for a family of 5.) I’m thankful the damages were limited. I’ve already battled microwaves-But until tonight, I’d thought the toughtest part was cleaning them. Apparently I was wrong. It’s the fire-fighting that is really tough. I believe this was a fluke, a rare ocurrance, but it bears a reminder- appliances can be dangerous. Use (or don’t use, in our case) with caution. Also- WalMart? In my opinion, you could stand to learn about customer service. If a giy carries in a smoldering microwave that you sold him, you might consider working with the customer. I’m glad this wasn’t any worse. Wal-mart isn’t exactly known for their customer service, and it’s one of my big, big reasons for not dealing with them. If you can’t get any answers or apologies out of Emerson, try sending your story/photos to The Consumerist. 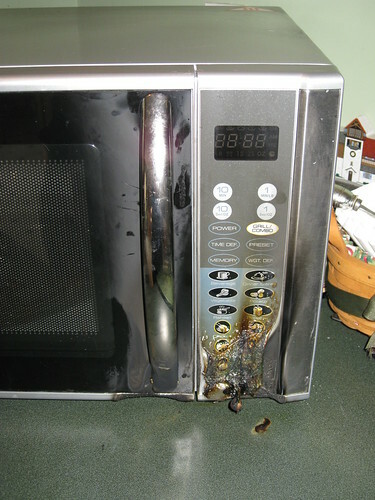 People need to know that your microwave randomly caught fire, ya know? I love that blog. So, I was reading your blog this morning, and thinking “that’s crazy! Thank God no one was hurt!” And then I went about my day….until I put my little tiny three month old boy in his fisher price swing, and IT CAUGHT FIRE. What? My whole house smells like burning plastic, and I can’t get over the vision of burning plastic drippin on him. I’m so very thankful I was in the room when it happened. I’m still in shock. Oh. My. Gosh. I’m so glad no one was hurt. That’s pretty scary. I have an Emerson #mw9325sl and last night while melting butter in a cup the plastic inside caught fire–it looked like a lightening bolt!! I’m trying to get in touch with Emerson but I guess they do not have customer support!!! The deal with the emerson microwave is not a fluke. Mine did the same thing. I did get ahold of Emerson through email who told me to cut off the cord and send it back. So I did and they are sending me a replacment microwave. But, I’m not sure if it’s a safe thing to do after all this. It’s craziness.